Little Tobago there is a site named Kelleston Drain which offers great reasons to scuba dive – The main attraction is the world’s largest single brain coral colony measuring 10ft (3M) high and 16ft (5.3M) across! 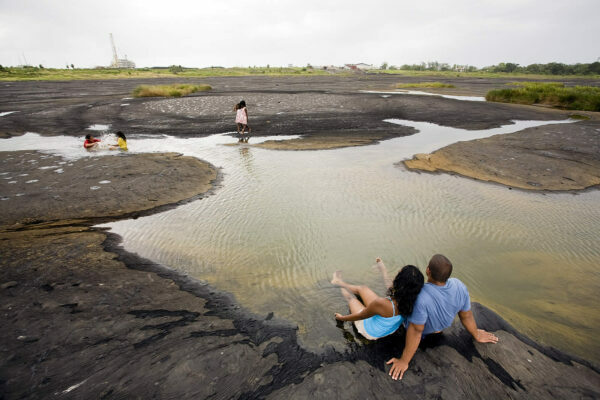 A destination of amazement and mystery, the Pitch Lake is the largest natural deposit of asphalt in the in the world. It is the largest commercial deposit of natural asphalt in the world – one of only three in known existence – and holds approximately 10 million tonnes of asphalt. Patches of clay, asphalt and water can be seen and heard hissing and burping making one think that the Lake is alive! The small pools that build up during the rainy season are said to contain high levels of sulphur and villagers claim they are the fountains of life, good for curing anything from skin conditions to joint pain. We don’t just have the largest roundabout in the world, the Queen’s Park Savannah is the center stage for Trinidad’s Carnival, cultural competitions and shows, sports, local food and other forms of entertainment while being surrounded by many famous attractions such as the Hollows, the Botanic Gardens and the Magnificent Seven. This large park comes alive on afternoons and weekends filled with sports enthusiasts, sports teams either playing cricket or football, joggers, family picnics, strolling couples and even persons seeking to indulge in some of our local street food served by vendors at the “Savannah Food Court’. Yes, yes…there are Carnivals all over the Caribbean but none as grand, spectacular and alluring as our very own. Known as the “Greatest show on Earth!” Trinidad and Tobago’s Carnival is a celebration of history, culture, fashion and art all fused together to produce sensational music, sweet sounds of steel-pan and vibrant, colourful costumes. The streets and cultural hubs come alive for weeks before the main revelry with steel pan competitions called Panorama, there are also nationwide competitions with the music originated from islands – Soca and Calypso as well as cultural and historical re-enactments such as stick fighting, jab jabs, blue devils and African drum playing, mas makers show off their creativity and with beautiful crowds or people everywhere! Th e Nylon Pool is a natural, metre-deep crystal clear swimming pool with a sandy bottom in the middle of the sea created by an offshore sandbar and a still lagoon. Take a rejuvenating swim surrounded by the deep blue ocean on one side and a palm-fringed beach on the other. Locals claim the water here has the ability to rejuvenate anyone lucky enough to swim in it and its sands are said to be a great exfoliator. 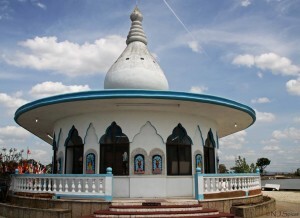 This Temple at Waterloo in Carapichaima, Trinidad is testament of one man’s love of Hinduism and was built through perseverance and strength. 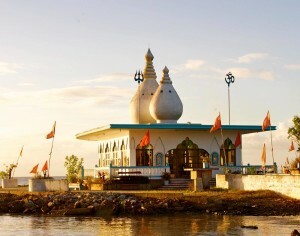 The Temple was the 25-year attempt of Siewdass Sadhu to construct a worship centre at no-man’s land – the sea. Sadhu dedicated himself to completing the temple. On his bicycle and in a leather bag, he carried stone by stone, assembling the base of the temple. Toiling and unloading buckets of dirt into the Gulf in an effort to create artificial land. The Waterloo Temple, better known as Temple in the Sea, is an octagonal- shaped colourful structure now a great cultural and religious attraction and one of the main highlights to any Central Trinidad or Hinduism tour. Something not to be missed, literally! 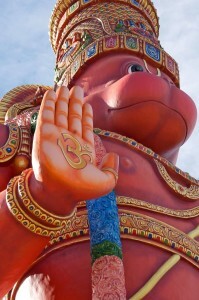 This distinctive 85-foot tall statue of the Hindu god, Lord Hanuman located in the village of Carapichaima, Trinidadis the tallest in the Western hemisphere and second tallest in the world. Built according to the Dravidian style of architecture of South India, this is the largest Hanuman murthi outside India. Hanuman is known as the best warrior among the Hindu gods since he protected the others from evil. Devotees come from near and far to pray to him for strength, courage and protection. Divali – A festival of lights! Known as the “Festival of Lights”, this festival is a religious occasion celebrated by the Hindu community – a large percentage of the population consists of East Indians and a significant amount are Hindus. Many of the celebrations are held at the the Divali Nagar site which is the official headquarters of the National Council of Indian Culture. At the Nagar there is a week of cultural, religious, educational and commercial activities which attract a wide cross section of the population not just Hindus. This celebration has not only been extended to the homes and communities but organizations have also embraced this festival with special events held to commemorate this occasion. It is when the majority of Trinidad and Tobago is literally lit up with deyas – a sure spectacle to witness! ong, dance and cultural and historical festivities reaching its climax on August 1 where ancestors are honoured and remembered. These 14,000 acres of forest in central Tobago which stretch for more than one-half the length of the island of Tobago, is the oldest protected rainforest in the Western hemisphere dating back to 13 April 1776. It is home to a number of flora and fauna and is estimated to provide habitats for twelve to sixteen species of mammals out of the nearly ninety mammal species in the Caribbean region.